Apple is a company as known for its imaginative marketing as its slick, genre-defining products. As you’d expect from a company that recently posted the biggest quarterly profit in history ($18 billion), Apple has plenty of money to splash on marketing, so you’d expect its campaigns to be spectacular. Recently, though, the issue has come clearly into focus, with many people speculating that the recent spat between Apple and pop star Taylor Swift wasn’t in fact a war of words about artist royalties but instead a carefully orchestrated marketing ploy designed to give both parties maximum exposure – to help Swift sell more albums and ensure Apple’s music streaming service is widely covered in the news. Whether this is the case or not, Apple is certainly a marketing behemoth – that much can’t be denied. As such, here are five of the best, from the company that shows others just how it’s done. 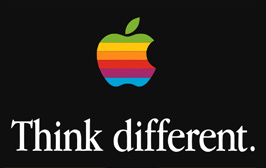 Though grammatically suspect, Apple’s ‘Think Different’ campaign was such a success it didn’t only win Emmy and Grand Effie awards but even went on to influence the art direction for a Wu Tang Clan album. The campaign itself revolved around a TV advert that featured a number of 20th Century personalities, widely known for thinking differently. These included Albert Einstein, Bob Dylan, Martin Luther King Jr., Richard Branson, John Lennon, Thomas Edison, Muhammad Ali, Mahatma Gandhi and Amelia Earhart. To support the campaign, posters featuring each famous face were produced, each bearing the tagline ‘Think Different’. The campaign is viewed as one of the most successful in American history, even today. The image of a true icon is whether it’s recognisable even in silhouette. Mickey Mouse, the Coca-Cola bottle and Gibson Les Paul guitars would all be clearly identifiable even with all detail stripped away. 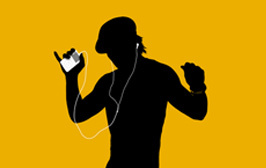 Apple sought to enter this territory with its long-running 21st Century campaign to promote its iPod range. Featuring colourful backgrounds and silhouetted people dancing along to their music, the campaign was a bold, brash affair designed to grab attention. It was also backed with loud, upbeat, rhythm-heavy music, often from undiscovered artists or those waiting to break through. Often, inclusion in the ads was all the band needed to hit the mainstream. Of course, Apple backed the TV ads up with equally vibrant posters and online ads, bidding to stand out in the increasingly competitive marketplace. The campaign may have been officially called ‘Get a Mac’, but it will be remembered by most as ‘Mac vs. PC’. 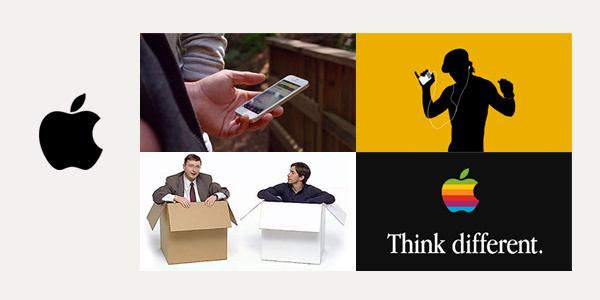 Starring David Mitchell and Robert Webb as PC and Mac respectively, the adverts were designed to highlight Apple’s products as being quicker, easier and more progressive than their Windows counterparts. In reprising roles similar to those played in cult series ‘Peep Show’, Mitchell and Webb made these adverts a huge success, with Mac and PC users alike still fondly remembering them some eight or so years on. A hallmark of iPhone adverts in recent years has been the distinct lack of actual advertising. The ads themselves haven’t sold products, services or capabilities, but instead something much less tangible – a lifestyle. Of course, brands have long known that selling a lifestyle will get a much greater response than selling a product (as it taps into people’s emotions) but Apple took this one step further. One example simply involved someone taking a photo of some children in fancy dress, then putting it up on their wall. 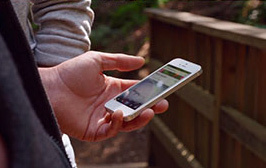 This was to showcase the iPhone’s panorama feature, but the promotional aspect was implied, not implicit. The same was true of ‘Photos every day’, which showed the kind of images people see when out and about – such as people getting their mobiles out to snap funny selfies or some nice scenery they’ve happened upon. There were no mentions of megapixels, aperture, or fps; just the images you could snap with an iPhone. It’s long been said that the best products market themselves. Whether it’s through industry reviews or word of mouth, the best products find a way of breaking through the parapet. Apple knows this perfectly well and manufactures products accordingly. Of course, Apple will want its customers to think they have the best product on the market with all the leading specs, but just as important is the money that investing in top-notch products will save the marketing budget.